Yams are tropical tuber crops. They are mainly cylindrical in shape, with rounded ends. The bark is mostly light brown when harvested and darkens during storage. They are a major staple in Nigeria. 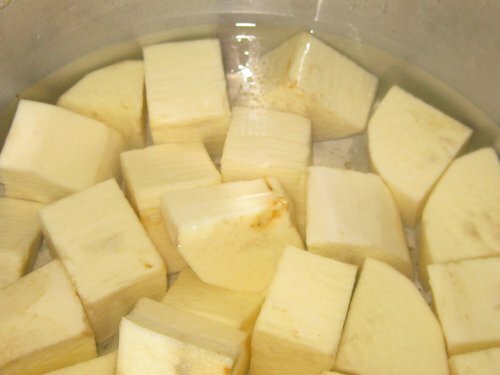 There are many varieties of yams but the most common are white yam (which is also referred to as the sweet yam), the yellow yam and the water yam. Yams are mostly popular because they are used to prepare a wide variety of quick recipes. A fufu meal derived from yam powder. This meal is served with various Nigerian soups. This is prepared by boiling diced yam and pounding it in a mortar with pestle. Recently, there are electronic yam pounders available. Pounded Yam can be eaten with any of the Nigerian Soups. This is a special delicacy of yam cut into small cubes and boiled then mixed with lots of green vegetables. It is a very nutritious and healthy meal. If you want a delicious yam meal without the added vegetables, then this is the yam recipe to go for. This is basically yam cut in various chip shapes and deep fried. It can be eaten with omelette, fried eggs, pepper sauce or tomato stew. This is barbecued yam eaten with pepper sauce. Always yummy. This is simply boiled white yam served with palm oil. For more yam recipes click here. Yam is planted during the beginning of the Nigerian rainy season which is in the months of March through May. The first sets are harvested in late July with the last batch harvested in early December. Yam can be stored for several months and it will still retain its taste. It is best stored in a cool, dry and well ventilated place. Raw yam should not be stored in very cold temperatures eg the refrigerator as this changes the taste. 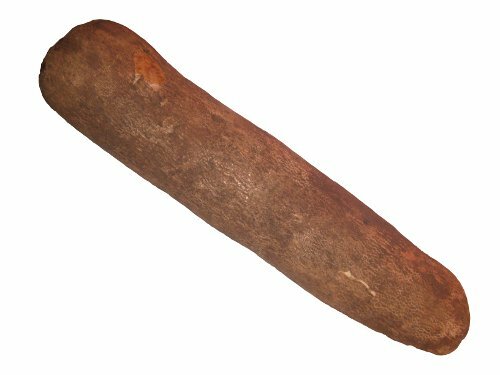 Yam is readily available in the open Nigerian markets or African food stores all over the world. However when buying yam in non-African shops abroad, be aware that some produce labelled as yam is not really yam but some variety of tuber crops that may be better classified as sweet potato. Since yams are harvested from the month of July, they are cheapest at this time of the year then become increasing expensive as the next planting season approaches. When buying yam, ask for white/sweet yam. This is the tastiest of them all unless a doctor prescribed water yam for you. Before you buy, carry out visual inspection of the yam. Press all parts of the tuber to make sure that it is firm all over. Soft parts are the first indication that the yam is going bad. Also, avoid the ones with bruises or cracks as much as possible. Most bruises occur during harvest and cause the affected part to go bad. Yams are rich in dietary fibre, vitamin B6 and C, potassium and manganese.